I’ll be the first to admit I’m not the best at staying organized: In fact, I usually hold on to items way longer than I should, and I often can’t find things, since they never had a specific home in the first place. While I’ve tried to find ways to clear out old clothes (and my kryptonite, magazines) from my very tiny NYC apartment, nothing’s really worked for me, since to be honest, I get way too attached to my things. I just can’t imagine throwing anything out. So, when I realized Marie Kondo had an app out (the KonMari app, available for free on the Apple app store)—and needless to say, I’d heard so much about her life-changing method of staying organized—I knew I had to give it a try. Having never read the book The Life-Changing Magic of Tidying Up (my leisurely reading tends to be more on the fiction side), I thought the app might help give me a shortcut when it came to organizing my space in a way that would work for my pack rat sensibilities. I usually hit a workout class at the end of the day or just veg out in front of the TV, but today, I dove straight into the app. I was given five categories to choose from: clothing, books, papers, komono (aka, household supplies), and sentimental items. I was instructed to take a picture of my space and upload it, along with the specific items I was meant to organize. Depending on the size of my apartment and the number of items I intended to sort through (I don’t own business clothes, for example, so I didn’t select that option), the app sets a tentative due date. My clothes were given two weeks, while my books three. I was meant to divide each category and tackle it separately, which made this process feel very achievable—I usually look to tidy my entire house at once and feel overwhelmed. While you aren’t given set guidelines or a strict plan to follow, the app keeps reminding you how the process works as you go through all your items (being “swift and deliberate”). You can also set push notifications that remind you when your task is due, or how much you have left to finish. I started with dresses. The app’s main purpose is to guide you through the Kondo process, so I was instructed to hold one, see how it felt—does it, as Kondo asks, feel “close to my heart?”—and then choose to toss it or keep it. Some items reminded me of really bad experiences in my life, so I ditched them even though I still liked the look, while others didn’t really spark anything in me. What I thought would be a 20-minute process took an hour just because I was trying to figure out whether things actually stirred up some kind of emotion within me, until I realized I shouldn’t overthink it (“swift and deliberate,” remember?). I started going much faster, sitting with each item for only 30 seconds or so, as opposed to a few minutes. In the end, I kept about 22 of 30 dresses—which was more than I expected to keep, if I’m being honest. I was home all day on Tuesday (thanks, NYC snow storms), so I was able to Kondo in the morning for about 30 minutes before work, at lunch for a 20-minute break, and all evening—seriously, we’re talking hours. I finished my entire wardrobe, and it went by a lot faster than I expected. While the app sets a timeline based on the items you have and how big your apartment is, you can pretty much spend as long as you want with the app on any given day: The app assumes you’ll tidy for about 15-30 minutes per day, but I used it for a good four hours on the day I was housebound. I tried not to overthink the process, which left me with about 30 percent of my wardrobe discarded (a combination of old items I didn’t use, versus items I did but didn’t feel much of a connection to). If I only kind of liked it, I kept it… because it sparked something in me that wanted me to keep it, if not pure joy. I uploaded a before and after pic on the app and was rewarded with a “badge” in the profile section, as well as a congratulatory email that reminded me why I was doing what I was: ”You will come to a point where you suddenly know how much is right for you.” The badges are given to users who complete categories and post before and after photos on, or by, their due dates, and your goal is to collection all 10—five are category-based, while the other five have to do with adding photos, questions, or updating your profile. I used Wednesday as a sort of cleaning break, but spent some time in the app with the Kondo community. 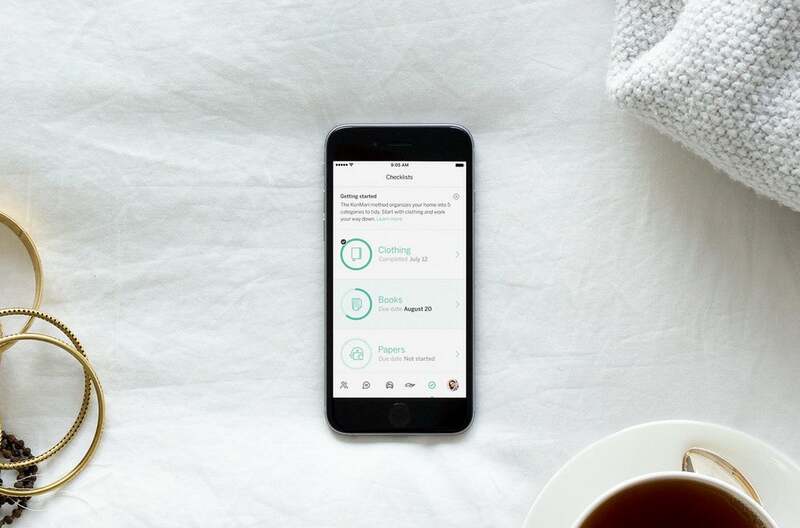 The app is divided into two parts: a personal section where you track your progress and a crowdsourcing section where people post their own photos, questions, and accomplishments. It helps to know other people are working on the same tasks you are, and it’s interesting to see difficulties and motivations from a different point of view—honestly, it was one of my favorite features of the app. Through people’s comments and questions, I saw that the major issue with Kondo’s approach is that people tend to overthink their emotions and why they’re keeping certain things, which to me is the antithesis of everything she preaches: If you’re unsure about something, just keep it, and try again later. One comment that really stood out to me was, “Is it normal for my home now to feel ‘cold’?” A lot of responses pointed out that if your home feels cold after you Kondo, you likely didn’t keep enough. It’s a personal journey of discovering how much to keep based on preferences and emotions—not by following a cookie cutter way of thinking—which was sort of what I initially struggled with. It was helpful to see people discuss their issues in detail, and the community is very active—most dilemmas receive almost 50 to 60 comments and likes. One user said she had completely lost her motivation, and asked for advice on how to keep going. While I was too new to really “lose motivation,” per se, I didn’t exactly find the process riveting—I don’t usually spend my days organizing—so I found many of the tips useful: have someone to hold you accountable, keep taking pictures of your tidied spaces so you see how rewarding the process is, and create a system that makes sure you’re not doing too much every day. The photos definitely helped a lot, and made me want to continue the process—it was kind of like having the entire app rooting for me every time I posted a picture, which was built-in accountability I hadn’t expected. It’s the same way you feel every time you post a picture on Instagram. People are actually watching and interacting with your content, as you can choose to make your photos public (I did) so that everyone can see them. One of the reasons I’ve dreaded cleaning (and all household chores, really) is because it’s not a social activity; you do it by yourself, and it’s not exactly a hobby that you chat about with friends. But this section helped me not feel so bored and alone. If I finished something or had a question, I could post it and get so many reactions back. It was the best form of positive reinforcement—never underestimate the power of social media. Although I was approaching things out of order—you’re meant to start with the first category, clothing, and work your way down to books, papers, komono, and then your sentimental items—that last category was a big one for me, and something I wanted to tackle. The app doesn’t forbid you from starting out of order, of course, but it seems to think clothes would be the easiest to start with, and quite possibly, the biggest. But I always keep everything from thank you cards and silly photos to Broadway show playbills and a teddy bear from my first trip to Australia (bought at Sydney’s international airport, to be precise), so my collection of sentimental items was actually quite daunting. They previously existed in a not-so-organized stack on my desk in my bedroom, and it was getting a little out of hand. So, I looked through them all one by one, to figure out what to keep. The shocker? I ended up only throwing maybe two of the three dozen items stored in that little nook, but I did organize them in a box that fits everything, from my first ever business card to a pen with my initials on it that doesn’t work anymore. Did I tidy? Kind of. Did it all spark joy? Yes. It was also more organized than it had been before, which helped me keep those items safely. My final day was spent doing komono items, which for Kondo means anything from makeup to medicines—basically, miscellaneous items. I started with my makeup cabinet, which was pretty easy: I just threw out stuff that was old, expired, or that I didn’t use anymore. There wasn’t much left to finish with, but they were all items I used on a regular basis, so I figured they could stay (a far cry from my sentimental items!). The biggest thing the app did for me was make me realize I didn’t have to stick to some idealized version of organizing—I could just do what worked for me. Am I the most organized, minimalist person ever now? Well, no. I still sometimes buy things I don’t really need—just this past weekend, I got too excited at the farmers market and bought truffle salt—and I held onto a few old workout clothes even though I don’t wear them because I have some good memories associated with them (looking at you, holey tank from my first SoulCycle birthday ride). But maybe that’s okay. I don’t want to live in a home that’s only filled with things that serve a utilitarian purpose. You need sentimentality and emotional pieces because those items make a house your home. While my apartment did not end up becoming the tidiest from this experiment, it is well on the way to being a home full of items that mean something to me. If you’re someone who needs more structure and wants to be told exactly what you should throw out and what you should keep, the Kondo method probably isn’t for you. But, with my closet as proof, I’m happy to report that it made me more organized than I have ever been in my life.